Hi, I am interested in your 2016 Mercedes-Benz G63 AMG 4MATIC (stock #MHM3123.1) listed on Autotrader for $104,900. I'd like to get more information about this vehicle and confirm its availability. Worldwide Vintage Autos is pleased to present this beautiful, fully optioned 2016 Mercedes g63 AMG. 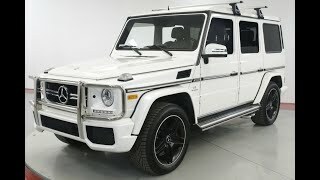 The Mercedes-Benz G-Class, sometimes called G-Wagen (short for Gel ndewagen, cross country vehicle), is a mid-size four-wheel drive luxury SUV manufactured by Magna Steyr (formerly Steyr-Daimler-Puch) in Austria and sold by Mercedes-Benz. In certain markets, it has been sold under the Puch name as Puch G.
Despite the introduction of an intended replacement, the unibody SUV Mercedes-Benz GL-Class in 2006, the G-Class is still in production and is one of the longest produced vehicles in Daimlers history, with a span of 35 years. Only the Unimog surpasses it.